Welcome to the 8th Annual Seth Burton Memorial!!! Awesome Player Packs for All Amateurs! Upgraded Player Packs if you Pre-register (first 72)! - 2 Discs included per Amateur player pack each with different artwork, 1 Innova and 1 Discmania!!! Minimum $3,000 added to Pro Purse!!! Minimum $3,000 added to Am Purse!!! 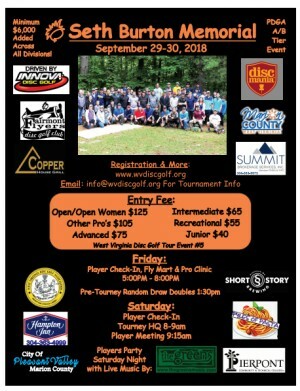 Featuring Prodigy Discs Pro Chris Dickerson and Discraft's Corey Ellis! Blended Final 9 tee-off for top 4 in all Professional and ADV Divisions. There will also be a spectator raffle following MPO with your chance to win a 1st Edition Crush Boys Mystery Box from Discmania!!! Player's Party Saturday Night behind the Marion County CVB at Pavilion #1 with Live Music by The Greens, Food, Fun and Refreshments by Fairmont's own Short Story Brewing! Special Room Rate just announced for this Event - $80 per night at nearby Hampton Inn!!! Call 1-800-HAMPTON or locally at 304-363-4999 and mention "Seth Burton Memorial" to get this special rate. You can also go to www.hamptoninn.com and use the Group Code "SBM" to reserve your rooms. This very special rate is guaranteed up to 1 month before the start of this event. Reservations made after this period may be able to get the same rate but, are not guaranteed so book early! Sponsors of the Seth Burton Memorial: Summit Brokerage Services of Fairmont, Pierpont Community & Technical College, MCPARC, City of Fairmont, Copper House Grill, City of Pleasant Valley and more TBA!